Author's note: As periodontists, we perform gingival augmentation procedures regularly. On occasion, a treated patient contacts their family dentist following this type of procedure with concerns about the surgical site. Family dentists are also involved in follow-up care, sometimes in the early stages of postoperative healing. The following article is intended to help guide the dentist through concerns they or the patient may have during a follow-up visit. Patient may experience pain, described as a constant dull ache or sharper pain during mastication or speaking (movement of oral and peri-oral tissues). Patient experiences anxiety over procedure and perceived lack of success. Perform complete extraoral (head and neck) and intraoral (teeth and soft tissue) exams to rule out postoperative infection. Evidence of postoperative pain, bruising, swelling or even infection does not indicate a gingival graft failure/loss. 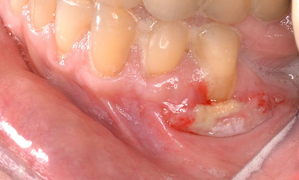 Is there evidence of tissue on the periodontal dressing? Is there trauma to the site as reported by patient? Is there evidence of new tissue covering the periosteum, apical to the tooth or teeth that received the graft? A free gingival graft (FGG) is placed with the goal of increasing the zone of attached gingiva. A connective tissue graft (CTG) is placed with the goal of both increasing the zone of attached gingiva and achieving root coverage of a previously exposed root surface. Dislodged or removed dressing may have evidence of tissue on it. In many instances, this may just be the sloughed epithelium and the remaining connective tissue will have remained/survived at the site (Figs. 1, 2 and 3). Most grafting procedures can withstand minor traumas. However, significant traumas (i.e., blow to the face, direct injury to the site with utensil/toothbrush), particularly if occurring in the first 24–48 hours postoperation, can cause graft necrosis. Clinical evidence of soft tissue covering periosteum is indicative of graft survival, even in the presence of persistent root exposure. Figure 3: Normal postoperative healing of a free gingival graft at 7 days. The whitish tissue is normal healing and is related to epithelial sloughing. There is remaining exposed root surface as the goal of the free gingival graft is to augment the keratinized gingiva. A successful FGG will show remaining root surface but evidence of healing tissue apical to the exposed root (Figs. 4 and 5). A successful CTG will have evidence of tissue covering the previously exposed root (Figs. 6 and 7). Figure 4: Healed free gingival graft 6 weeks postoperation. Healing is successful, but there is still root exposure. Figure 5: At 3 months postoperation, there is still exposed root but marked evidence of keratinized tissue. This indicates a successful free gingival graft. Figure 6: Gingival recession, before connective tissue graft. Figure 7: Healing of gingival graft, 3 months postoperation. Prescribe antibiotic if there is evidence of infection: usually amoxicillin 500 mg, t.i.d. for 3 days is sufficient. Confirm if previous antibiotic has been prescribed and consider alternative drug. Pain management: Prescribe anti-inflammatory medication (ibuprofen 400–600 mg t.i.d. or q.i.d. for 4–5 days) or acetaminophen-codeine-caffeine (one tablet q. 4–6h. p.r.n. for 3–4 days). Advise the patient to perform minimal or no mechanical brushing of the site. Start or continue to use antibacterial mouth rinse for 7–10 days (chlorhexidine 0.12%). Contact a periodontist, if required, to advise about your and the patient's concerns. Follow up in 21–28 days. Assess root coverage for CTG (may achieve partial coverage of exposed root surface). Measure the zone of keratinized gingiva for FGG and CTG. If there is no evidence of root coverage (CTG) or of a zone of keratinized gingiva (FGG), retreatment will likely be required. In this instance, contact a periodontist. Success or failure of graft will be determined by the periodontist or the operating surgeon. Failure happens in less than 2% of cases. Dr. Logue is an assistant professor in the department of dental clinical sciences in Dalhousie University's faculty of dentistry. She also maintains a periodontal practice in Dartmouth, Nova Scotia. Parameter on mucogingival conditions. American Academy of Periodontology. J Periodontol. 2000;71(5 Suppl):861-2. Greenwell H, Fiorellini J, Giannobile W, Offenbacher S, Salkin L, Townsend C, et al. Oral reconstructive and corrective considerations in periodontal therapy. J Periodontol. 2005;76(9):1588-600.